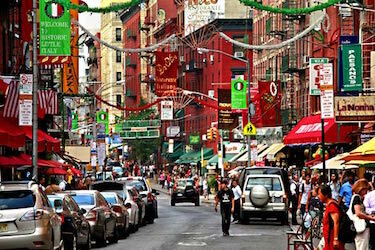 Although no longer one of the largest Italian neighborhoods in NYC, Little Italy is one of the most well-known communities and is often the first place locals and tourists think of when looking for a slice of Italian culture. The iconic area is best known for its abundance of authentic Italian food, locales immortalized by The Godfather and the Festival of San Gennaro, an 11-day festival celebrating Italian culture each September. Now spanning three blocks on Mulberry Street, the mini-neighborhood is a blend of old and new, possessing old-world European charm alongside trendy storefronts that have slowly spread from the more fashion-forward districts of SoHo and the Lower East Side. The food scene is similarly blended, with excellent Italian food at longstanding establishments such as Angelo’s, DiPalo Fine Foods, and Ferrara Bakery and Café mixed in with new favorites such as The Butcher’s Daughter, Seamore’s, and Baz Bagel and Restaurant. Prices in Little Italy have increased in recent years in response to renovations of older buildings into new condos. Plans are currently in place to build a seven-story condo that will house the Italian American Museum on the ground floor, bringing a new wave of residents to the area. But with Little Italy office space rent averaging only $53 per square foot, companies can still expect to pay less than Midtown South or Lower Manhattan areas such as Hudson Square, Union Square, SoHo, and Tribeca. Mulberry Street is the location of some of the city’s trendiest clothing stores, salons, restaurants, and bars. Little Italy is also home to a variety of creative production and digital marketing agencies, architecture and urban design firms, and event spaces. Notable tenants include Media Monks, StartApp, Rockerbox, Spherical, and BarkBox. WeWork’s first NYC location is on the corner of Grand Street and Lafayette. A quick commute south provides access to City Hall, New York County Supreme Court, USCIS, and New York Law School, making Little Italy an ideal location for law firms or policymakers. 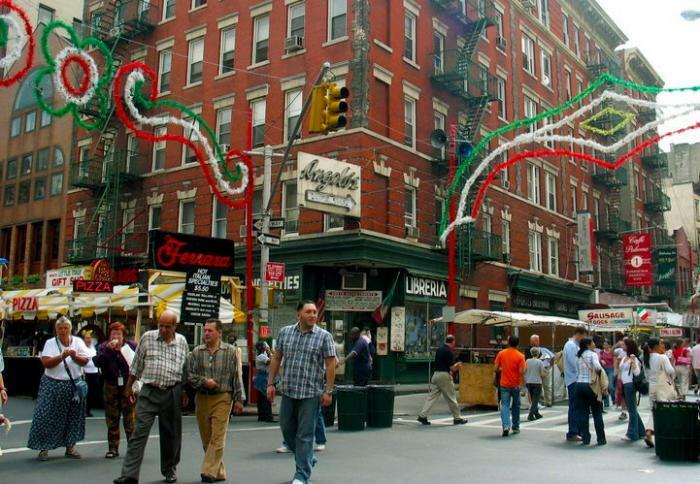 As immigrants from Naples and Sicily came to New York, many settled in Little Italy. The Italian population reached its peak in 1910, and the area became known for its unique and insular culture, food, and language. At its height, Little Italy spread from Canal Street to Houston Street, and between Lafayette Street and Bowery, encompassing almost 50 blocks. Over time, the Italian families who had settled in Little Italy left for other parts of the city including Queens, Brooklyn, and even New Jersey. 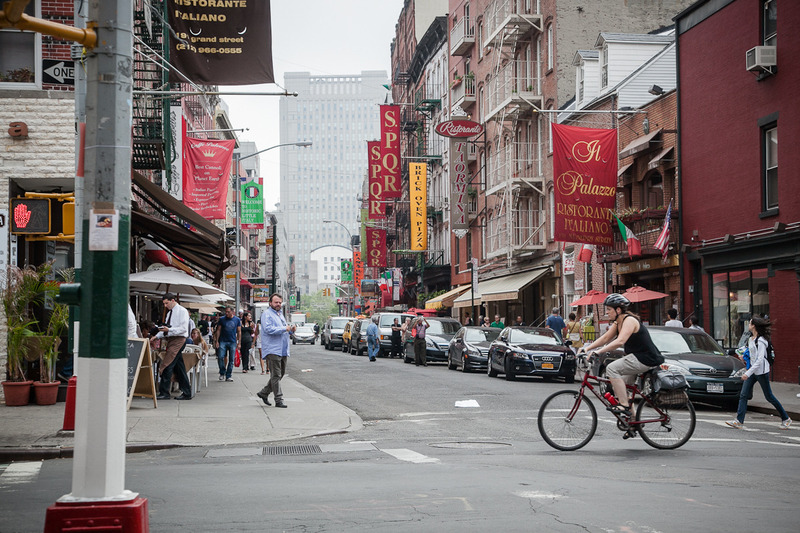 With SoHo and Chinatown growing rapidly on both sides, the streets of Little Italy were slowly overcome until it shrunk to the size it is today. However, it’s distinct culture and ideal location attracts an urban young population, which has recently led to rising property prices. Currently, Chinatown and Little Italy are listed in the same historic district. WalkScore rates Little Italy is the most walkable neighborhood in NYC, but this is slightly skewed because of its size. With a high number of tourists visiting year-round, Mulberry Street in particular is often crowded with people, making it difficult to navigate by bike. Nestled in Lower Manhattan between SoHo and the Lower East Side, Little Italy is easily accessible by subway, bus, or car (though we never recommend driving in NYC unless absolutely necessary). A handful of subway stops are located less than 4 blocks from Mulberry Street. From the east, commuters can take the 6 train to Canal Street or Spring Street, or the M103 bus on Lexington Ave to Grand Street. The N, Q, R, B, D, F, and V trains also have stops in the area. Drivers commuting via the Holland Tunnel will find themselves a quick drive from the St. John’s Park exit. Or transfer from the PATH train at 14th Street and take the F train to the Broadway/Lafayette station before walking just a few blocks. Nearby districts include: Chinatown, Nolita, NoHo, and Lower East Side.